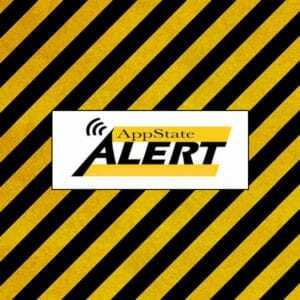 BOONE, N.C. — Appalachian State University will conduct a full test of its emergency notification system — including siren, email, voice and text messaging and the Alertus desktop notification system — at 11:55 a.m., Wednesday, Sept. 5. Following the test, faculty, staff and students will be asked to respond to a brief survey regarding their preferred method of receiving emergency alerts and other information related to emergency messages. A link to the survey will be included in the all-clear email notification. More information about emergency preparedness at Appalachian, including how to register for the mobile phone and email AppState-ALERT emergency notification system, is available at https://emergency.appstate.edu. The siren tests are conducted on the first Wednesday of the month. Scheduled dates for Appalachian’s upcoming tests are Oct. 3 and Nov. 7.